Hello, I’m Elena Gordeeva. I want to inform you that Brad Jordan contacted me in December and January 2016 on Facebook. There is posted his profile with the real pictures. Also he emailed me some of his pictures and with kids. He pushed me to apply to global money finance bank of America. And military department of licensing. Of course I was suspicious while communicating with him and understood that it was a scam. Just would you mind clarifying me please, as I’m not brilliant at English, whether I got it right that the scammer used the name of that honest soldier Brad Jordan? Yes, and if it want money.. Do not make mistake to do this.. So, I wonder if this real person Jason B.Jordan knows, that his name and his pictures are used by scammer? That there are a few profiles on fb under his name? Is there any possibility to inform him? I think these people are not interested so much of what happens with their photos, the problem is serious when, with these pictures, have been cheated or deceived them. Jordan, Ethan Jordan in my case, contacted me on fb one month ago. We start chatting everyday, he claimed he was in Afghanistan on a peace keeping mission. Of course he started saying he loved me, two days back while he was not online I searched internet to know more about him, and I found out about the scam. I sent him via facebook pictures of his frauds and he immediately removed the profile from facebook. He is still online however as Jason Jordan with different profiles. Sorry Karen, am I right In understanding that the real soldier Jason B.Jordan is dead? Do you know it exactly? 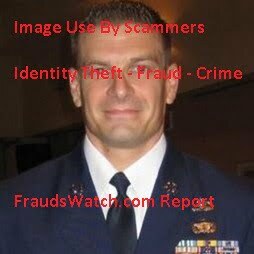 I was recently contacted by the scammer using pictures of the person on this picture and they are using his kids too!!! His most recent FB profile is Jeff Jordan from Bronx NY and Jeffrey Jordan (Arnold). I reported both accounts to FB , it is a crime to impersonate anyone, but it is a Shame to impersonate the people that are risking their lives for Peace in the world!!!. I hope the scammers get what they deserve. I found his image (MASTER SGT. JASON B. JORDAN) on meetme as someone named Bryan who is from Mackay, QLD Australia. He told me that he has 3 children and his daughter live in US, and his mother is taking care of two sons at his home in Mackay. He said to me he works for a project on construction as an engineer in Turkey. 7hours back from Australia. He wants to visit me after couple of months and stay with me for few weeks for a holiday without coming back to Mackay. I was not asked anything to send yet but his voice sounds like a perfect African so that I suspect him as a scammer and bingo! He navigated me on Viber +1 917-391-1011. Since I found his photos as a dating scammer, I just blocked and deleted him from my contact. He’s on tagged too as Jordan walker. Just messaged me on there. Trying to convince me he’s in syrya but on a base in Turkey at the moment. Who can stop him already? Has he succeeded in his goal to get money?